Cat toys can come in many different shapes and forms. Usually, we think of catnip mice, tracks, balls and wands and fishing rods. 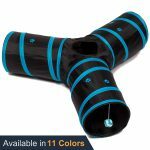 But there are many other fun toys out there which are unusual and different and give your cat a completely fun experience. We have a roundup of some of these toys here. Crinkle tunnels are lots of fun as they allow your cat to run through the tunnels whilst the material also makes an attractive noise. If you have more than one cat then they can have even more fun as they chase each other through the tunnels and hide from each other. The Prosper Pet Cat Crinkle tunnel is a three-way tunnel which we reviewed here. This is a beautifully boxed package of 7 different cat toys. This is perfect to give to a cat lover as a gift and we reviewed the box here. No round up of cat toys is complete without at least one mention of the Ludipuss cat tank. This amazing item has been made to resemble a large tank and the attention to detail is amazing. 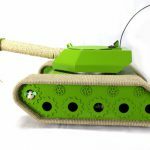 The cat tank can be a toy, a scratching post, a cat bed or even a cat condo. Have a look at this cool item here.